I was inspired to pick up a pretty little bag of Alaska steamer clams at the market this week. They looked nice and fresh and their price looked good as well. If you can’t get your hands on Alaska steamer clams, try littlenecks or manilas instead. Choose clams that are closed shut and are free of cracks and chips or broken shells. I was stunned at how quickly this dinner came together, which was of huge importance because we had a Christmas program at the kids’ school to get to by 6 p.m. By the time the rice was done steaming, everything was ready, and we had a restaurant quality dish made from local, fresh seafood in about 20 minutes. 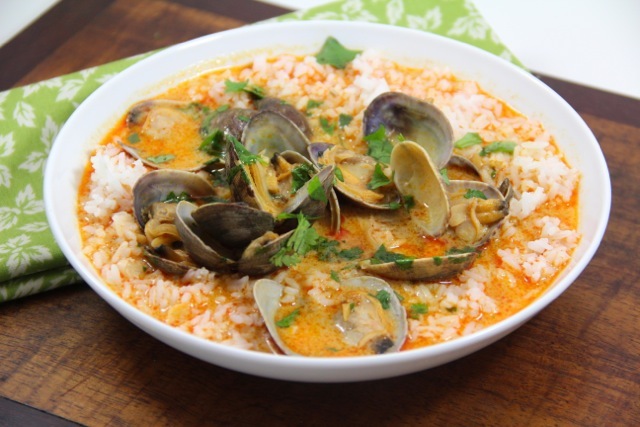 These small varieties of clams only need about 5-7 minutes steaming time, so they are a fantastic midweek meal option when you want something tasty and quick. And this slightly spicy ginger coconut red curry broth is just yummy. Once the clams are all gone, you’ll still be drinking it with a spoon and licking your fingers. I served ours over steamed rice to soak up all that broth, but a side of crusty bread would also be great for dipping. This was a huge hit with my fish and seafood-loving 9-year-old. My youngest mostly just wanted to play with the shells. (For best results, soak your clams in a cool freshwater bath for 20 minutes prior to cooking). Rinse and clean your clams. Discard any clams that are broken or are already open. Set aside. In a pot or dutch oven, melt the butter over medium heat. Add the garlic and ginger and cook about two minutes, until fragrant. Stir in the curry and cook another 2 minutes, followed by the fish sauce, chicken broth, and coconut milk. Bring to a simmer, lower the heat, pour in the clams, and cover. Steam the clams for 5-7 minutes until they all pop open (if there are some still unopened after 7 minutes, discard them). Remove from heat. Stir in cilantro, the juice from 1 lime wedge and season with salt to taste. Serve with additional lime wedges and steamed rice or crusty bread.